We have a 1.5 ton JCB machine, with rubber tracks. We hire this out at 30€ per hour, which starts as we leave our depot in Catral and finishes when the job is done and we are ready to leave your house. 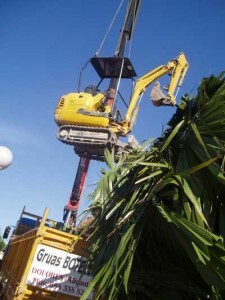 It comes complete with an English operator who has 35 years’ experience of driving excavators. His control of the machine is masterful and besides his ability to work in very tight areas, he has a great sense of humour! He thinks about the job in hand at all times and is a great favourite with customers. We can accomplish a huge amount of work in a short period of time. For example, a recent job was to excavate a trench to the depth of 50cm (20 inches). This was for a new water main to be laid and was a deeper dig than usual because tractors and other agricultural machines often cross over the area. The length of the trench was considerable, at 185 meters (about 200 yards). The trench was excavated and backfilled, (once the main had been laid), in a total of 10 hours. It cost the delighted homeowner just 300€. JUST COMPARE THIS TO THE COST OF PAYING TO HAVE THIS JOB DONE BY HAND! 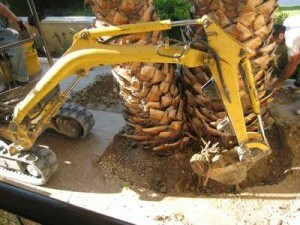 We dig foundations for garden walls, extensions, garages, patios, etc. We clear and grade the land, removing old tree roots. We demolish old structures, such as outhouses, barbecues, walls, etc.